Philadelphia - There are some signs of discontent amid the celebration of Hillary Clinton’s acceptance of the Democratic presidential nomination. 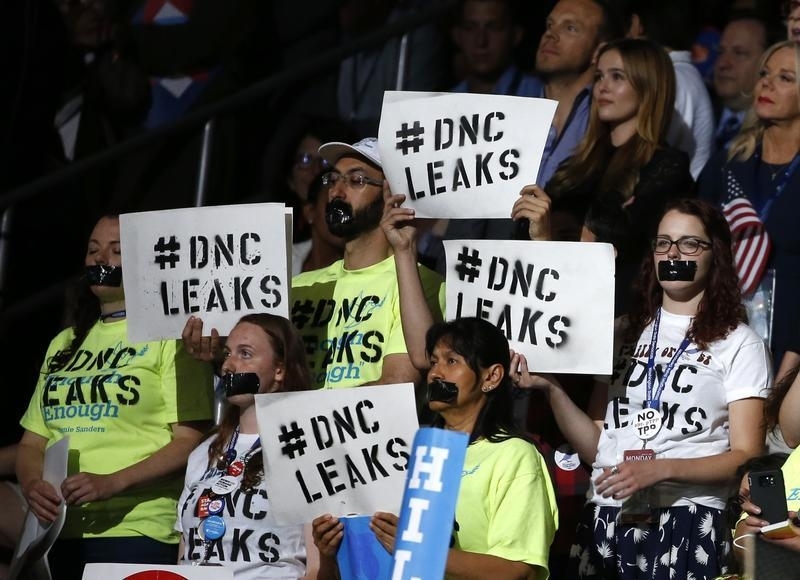 As Clinton spoke, several people in the crowd at the Democratic National Convention unfurled a banner that said “Wikileaks.” It’s a reference to the leaked party emails that some say show the Democratic National Committee favored Clinton over primary rival Bernie Sanders. Near the Hawaii delegation, a few delegates waved signs for Green Party candidate Jill Stein. Some Sanders delegates sat quietly throughout the speech. Clinton struggled to keep command of the arena. She was repeatedly interrupted by chants of “Hillary!” — that was her supporters’ way of drowning out hecklers. The next politician who promises all that the voters want to hear and when in office listens to the big money dictating their desires. If sane people were there, they too would've shouted.. HiLIARy,HiLIARy, HiLIARy.... FOR PRISON 2016! Both major candidates belong in prison. That big money used to be Donald Trump.